I'm, what my mom used to call me, an eternal optimist. I might get down and out sometimes but I am constantly looking for a silver lining. So instead of being relieved that this year is almost over like a lot of my Facebook friends are......I'm taking everything that happened to me as a learning experience. My biggest lesson? I'm human. Things happen, life happens, and your reaction happens. You can stress yourself out with the would-a, could-a, should-a *or* you can reflect and learn. I've learned that I can do so many things like going back to college at 35, and I've learned that when you lose someone your world turns upside down. Both are great lessons in life. It's weird to say that about the bad, but it really is. The good has shown me what I am capable of by myself and the bad brought my husband, sisters, brother and step-dad closer (although some family, it has brought out their true colors which is super sad but that's on them). 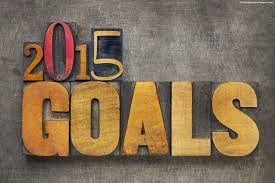 So what are my goals for 2015? - To get back to my goal weight. After my mom passed away I went through phases where I could careless what I ate to micro managing everything I put in my mouth. I needed to start healing from the inside before I could fix the eating issue, so I just focused on that. I wound up topping out at 210 pounds at one point (I'm 201 today because mainly I'm working on the next goal). - I'm regaining my happiness and be content. Not all the time, that's impossible.....you need to have every emotion. But most of the time, well yeah you can be happy. I had it once. I know what it feels like and I want that back more than anything else. Everything seems to fall into place and when it doesn't, I can usually roll with it.